Poise Hourglass incontinence pads for women, a new line of bladder protection products. Designed for women 45+ who carry a few extra pounds. Heavier women can experience pad bunching, twisting or roping which can lead to leakage. The new hourglass design aims to prevent that. Plus the pad and carry pouch are more feminine looking. It is estimated that one in three women experience at least occasional instances of light bladder incontinence. Plus, more than 20 percent of women currently experience pad leakage, especially those who may be carrying around a few extra pounds. Extra weight can result in pads bunching up and leaking. (The company did not say if the new pads actually leak less, so we are not sure). All women appreciate the more feminine look with pastel floral patterns rather than just being just a white rectangular clinical looking pad. Plus, it has a pretty package and wrapper design. 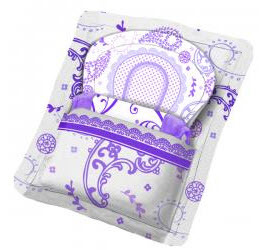 Poise Hourglass design is available in the three most absorbent sizes. They are designed for boomer women (45+) who may have greater absorbency needs. 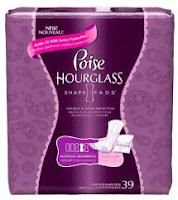 With new Poise Hourglass, now you can feel ‘just showered fresh’! “We think this is a good first step to breaking down barriers and taking away the stigma surrounding incontinence.” said Lynn Wilson, Founder of The CareGiver Partnership. However, some of the words used to describe the new line is manufactures speak and still off the mark -- “Triple layer core with front intake zone keeps you dry and protected.” Can you hear two ladies talking about the new pads using this language? "Interestingly, the number one place ladies discuss incontinence is at the beauty shop. We’re kind of surprised that isn’t where the companies are sampling and providing literature." Designed for older women who may be heavier and experience pad bunching leading to leakage. Triple layer core with front intake zone keeps you dry and protected (what ever a front intake zone is). Flexible stand up leak shields provide a 3D fit to help reduce side leaks. More feminine looking - paisley print with different shades of purple. Made in USA from domestic and imported material. 9.5” X 4” – 2.75” in the middle. See all the new Poise Hourglass Pads here. $3.49 for a 4-count sample of any absorbency. About The Caregiver Partnership. Lynn Wilson founded The CareGiver Partnership based on her experience in caring for loved ones as well as providing the highest level of customer service. She takes pride in offering personalized service that helps her customers find the best solutions for their individual needs. Now that her children are grown, Lynn enjoys spending time with her granddaughter while also helping to care for her mom. To find out how The CareGiver Partnership can serve you, call 1-800-985-1353 M-F 9-4 CDT.